On first inspection, one might assume these guys to be just another Ramones influenced pop-punk band. However, that would be shortsighted. 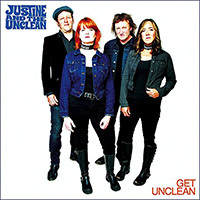 Give Justine & The Unclean – Get Unclean a thorough listen and you learn that they are really a great deal more. There are some obvious Ramones influenced songs such as “Passive Aggressive Baby”. And it’s a pretty fair tune. The better songs on Get Unclean draw from other sources of inspiration, though. “Love Got Me Into This Mess” with its chorus sung in a higher register sounds just a bit like the seminal LA punk band X. The song is thematically consistent with those of X, too. The rockabilly shuffle of “I’m In Love with You, Jackass” suggests similar influence. 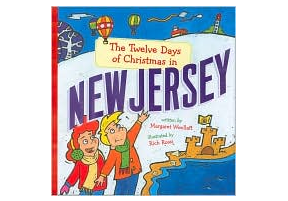 It’s a lot of fun lyrically, as well. That having been said, the best track is saved for last. The guitar jangle of “Something Out of Nothing” will catch your attention right off the bat. From start to finish, this song is one big power pop hook. I instantly fell in love with it. These guys have a certain something that I can’t quite put my finger on. They have a bit more dimension than most bands, I guess. While not every song captured my imagination, there’s plenty here to make me think that we’ll hear a lot more from Justine & The Unclean. And I want a front row seat for it. Just released on Rum Bar Records, you can get a copy of the CD or digital download from their bandcamp page.